Help! My Dog Hates the Snow! Are you puzzled because your dog seems to give snow the cold shoulder? Is your dog not eager to rush to the door when you bring out their leash on a snowy day? Just like people, not all dogs are fans of snow or cold weather. In fact, among four-leggers living under one roof, there can be snow fans and snow haters. Resist yelling at or forcing your dog into a snowy backyard to potty. Instead, take on the role of pet detective and look for clues that may explain why your dog isn’t the biggest fan of the snow. Just like people, some dogs love the snow while other dogs hate it and would rather stay in the warm house. Here are three common reasons some dogs hate snow and several solutions to try. Sinking deep into snow can cause apprehension and downright fear in some small dogs. They can feel they’re trapped and unable to escape the snow. Small dogs like Chihuahuas, Shih Tzus, or low-to-the-ground dogs like Corgis and Dachshunds lack the leg length, strength, or height to power through snow drifts like a large breed dog can (such as Labrador retrievers and German Shepherds). They are more apt to feel the snow and ice on their underbellies than long-legged dogs. Solution A: Designate a space near your backdoor that is kept snow-free and usher your dog on a leash, if necessary, to that place for him to potty. Be encouraging and try luring him with small healthy treats. Shoveling a path that your dog can easily walk on will help increase his comfort level in going potty outside in the winter. Solution B: Provide an indoor pet potty made of faux grass and odor-trapping pad during nasty snowstorms, especially for small, geriatric, and arthritic dogs. Keep a bottle of a commercial protein enzymatic cleaner handy to properly clean up any urine spills and eliminate urine odors in your home. Some dogs feel the winter’s chill more than others because they lack a thick coat to insulate them. Breeds with little to no hair like Chinese Crested and Greyhounds get colder quicker than Siberian Huskies, Samoyeds, and other northern breeds that sport cold-resisting coats. Dogs lacking these thick coats may shiver, hold up a paw or whine – signals that it is far too cold for them and they need to come inside. Don’t ignore these signs or your dog may be at risk for hypothermia or frostbite. Solution A: Fit your thin-coated dog in a canine coat (or sweater) before venturing outdoors. Make sure the coat fits his torso so he can navigate easily. The coat will help him retain body heat. Solution B: Shorten the time your dog spends outside to prevent the risk of hypothermia or frostbite from occurring. Solution C: Consult your veterinarian about switching your dog to a quality commercial food during the snowy months that is high in fat — a surprising metabolized source of energy. Is pet insurance worth it? 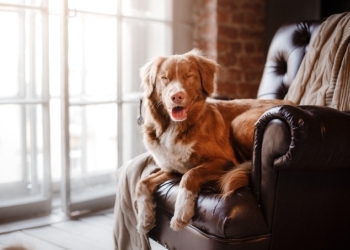 Learn more about pet health insurance plans for your dog. Salt and de-icing chemicals sprinkled on sidewalks as well as ice shards can cut and irritate paw pads. Some brands of deicers can be toxic if ingested by your dog from licking their paws. In addition, snow and ice can accumulate between your dog’s paws and hinder his ability to walk. Solution A: Reduce the risk of ice accumulation on your dog’s feet by having a professional dog groomer clip the hair between your dog’s toes. Coats for long-haired dogs should also be trimmed to prevent ice balls or de-icing chemicals from clinging to their coats. Solution B: Dab petroleum jelly on your dog’s paw pads before walking outside on icy or salty surfaces. Or purchase nontoxic deicers to use on your sidewalks and concrete patios. Inspect and wipe paws upon returning inside. Inspect your dog’s paw pads after each walk and dip his paws in bowls of room-temperature water and then wipe them with a cloth to rid ice or chemicals from in between his toes. Solution C: You can also introduce your dog to wearing special protective booties that provide added traction on icy surfaces and protect paw pads. Keep in mind, not every dog is a fan. But you will have a greater chance of his acceptance if you use praise and small treats (and patience) in introducing these booties indoors first to your dog. Make sure your dog feels comfortable walking in these booties inside before you progress to outdoors. Build on each small success. What are some ways you have been successful in making your snow-loathing dog into one who at least tolerates snow? By Arden Moore for Pets Best, a U.S. pet health insurance agency for dogs and cats. Moore is a dog and cat behavior expert, master certified pet first aid instructor, author of 26 best-selling pet books, and radio show host.